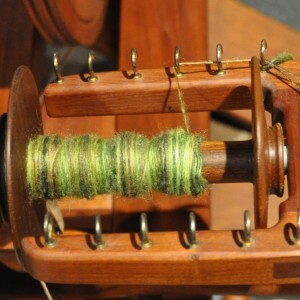 One of the forms of spinning that has become popular is the “inch-worm” or sometimes called the “worsted” method. 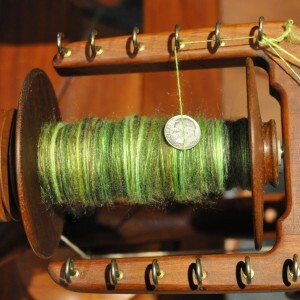 The spinner holds the wool “package” (be it locks, rolag, roving, or tops) in the back hand (or hand furthest from the wheel), and uses the front hand to pull out the draft area and push the fiber towards the wheel. This can produce a very even and accurate yarn, especially for beginners, however, at a cost. The main cost is speed of spinning. There is a functional limit to how quickly you can perform this operation. An alternative spinning method is to have the back hand draw the wool. 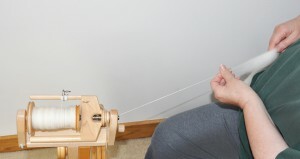 If the spinner tightens the brake so that the pull of the wheel is enough to draft the yarn (this also happens when there is a wide variance between the bobbin and drive whorls of a double banded wheel), then the hand holding the wool package is the one which is pulling out the draft area against the pull of the wheel. The other hand need not be involved at all as in the case of drawing from a rolag. This is called a “long-draw” which is essentially spinning with one hand. Or, if spinning combed tops or roving, or other more “slippery” fiber formats, then the front hand “holds back” the spin and slides (gently, no death grips here) along with the draw. In this case, both hands stay ABOUT the same distance apart during the draw and during the release into that strong pull of the wheel. Both hands move back and forth from the fully extended draw to the release onto the bobbin. 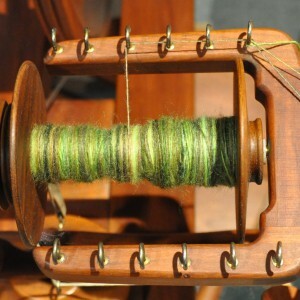 This is called “woolen” spinning. The back hand is pulling the wool away from the wheel and controlling the amount of wool that will be in the yarn. Your hand must be loose, so the wool in the roving, tops, rolag or whatever, can always be available to the draw area between your hands. Note that the spinning activity actually takes place some distance from the orifice of the wheel. This introduces another advantage: you can pull out VM, unwanted slubs of fiber, or other debris BEFORE it hits the spun yarn. 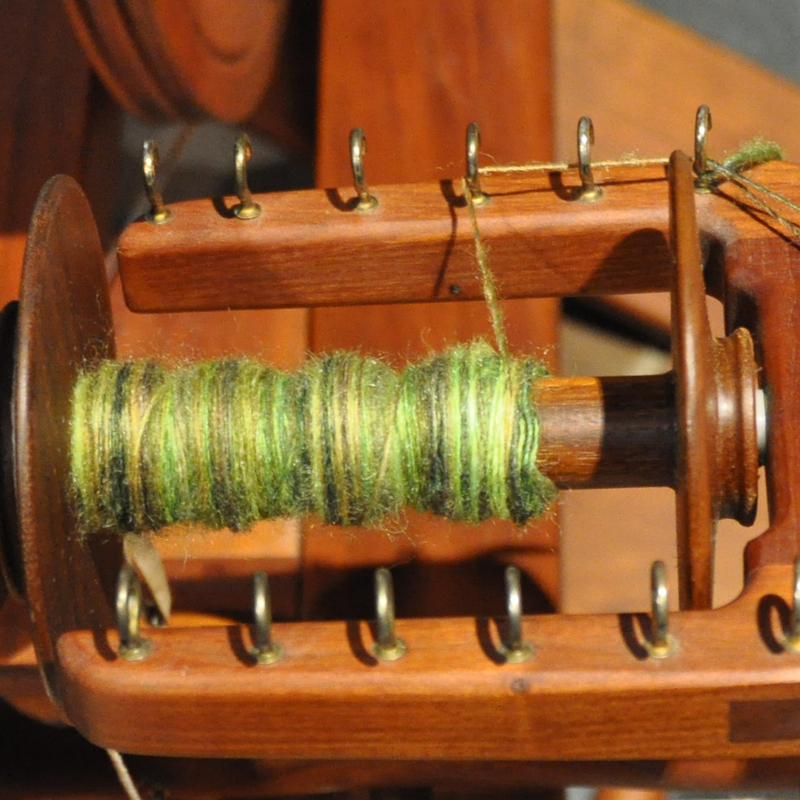 The big advantage to this form of spinning is production speed. 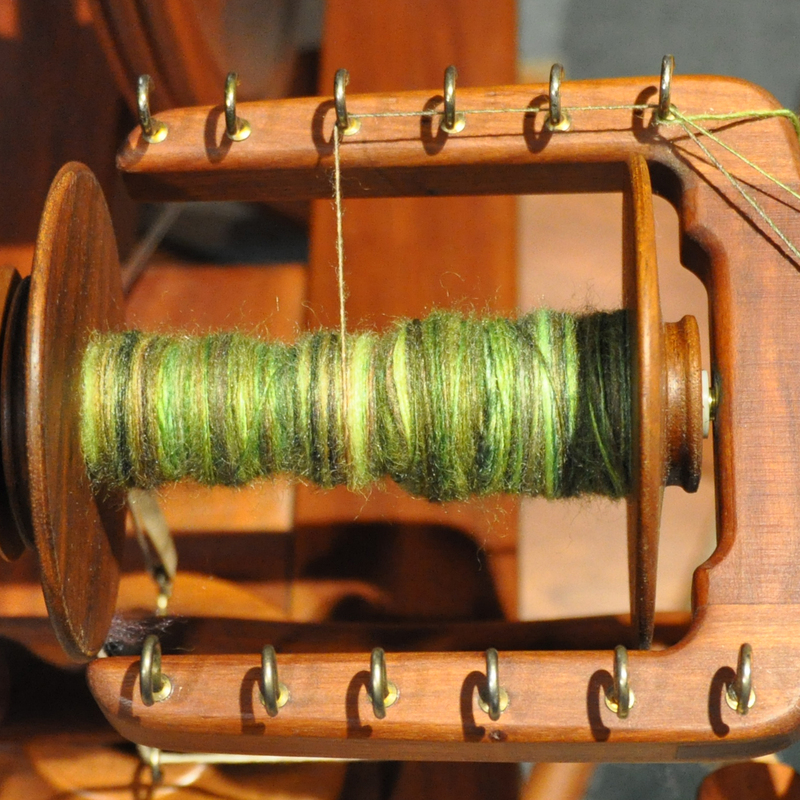 The big disadvantage is that it takes more practice to perfect the technique and spin an even yarn. Here are some pictures taken at intervals to show what is possible in terms of production. I’m spinning on my Lendrum Saxony with Scotch tension on the smallest of the standard whorls, an 18 ratio (which is about the same as my CPW). This is a 6 ounce bobbin. I should have moved the last hook before I built up so much yarn that it toppled, but I wanted to show the shaft size. Another 5 minutes of spinning and I am filling up the second level of the bobbin. This is a 75% BFL/25% silk handpainting combed roving/tops. At 20 minutes, one ounce of fiber is spun into about 200 yards. 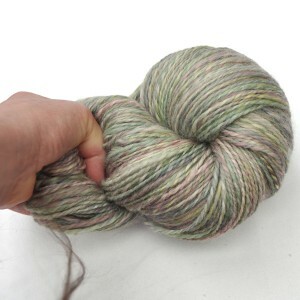 (This will be part of a two skein set—watch for it in October!) The average spinning speed is 600 yards an hour— IF this speed were sustained. Do I spin at this speed all the time? NO, not at all. (I’m usually spinning at about 400 yards an hour which is very sustainable even while watching a movie.) This is just to show you what CAN be done with this technique of spinning. This with the alternating exercises of spinning for speed and spinning for accuracy can improve your yarn production in both ways! Ilga often gets comments from customers about how the colors of the fibers look JUST LIKE THE PICTURES. This is not an accident. Ilga takes every image into Photoshop and plays with it until it is as close to the original as she can make it. Another thing, be sure your monitor is color calibrated (check the manual to see how). Whether you use Photoshop or another photo manipulation program isn’t important. Whether your picture is for Ravelry, sending to your great-aunt, or just for your records, color accuracy is important. Here is a series of three pictures adjusting a photo. If in doubt, practice with having flesh tones in the picture. The first picture is right out of the camera. Telltale signs that something is wrong are the murky whites, the dull contrast in the yarn and that bright pink thumb. The second picture is after white levels are adjusted. The white is brighter, but still a little pink, the colors in the yarn are perkier, but that thumb is still a problem. In the third picture, the magenta and cyan color ranges are adjusted down. Now the white background is less pink (and so is the thumb) and the yarn doesn’t look as yellowed. This is not CHEATING, this is making sure that the colors of your picture actually match the real world a little better. Other tips: Get to know your camera. Ilga IS NOT a camera whiz/geek/whatever…this is more about being observant. (Some cameras allow you to adjust greys against a known (read: you need to buy it) grey card. There are little idiosyncrasies of your camera and light which you can learn. Ilga’s camera LOVES greens, is very good with blues (it’s digital, film cameras HATE blues), and is a little too rambunctious with reds. Notice which times of day are best for making the most accurate pictures. NEVER take your pictures in direct bright sunlight. Keep your backgrounds simple. Ilga is sometimes asked how she achieves her high spinning productivity. Here is her answer. This has previously appeared on the Edgewood Garden Studio Facebook page, and on Ravelry, but we post it here so it will be easy to find in the future. Well, first, I spin every day…or pretty close. If I am FLYING somewhere, I don’t take a spinning wheel…but if I am DRIVING and will be gone overnight, I generally have a wheel with me. The other BIG productivity help is that I do NOT inch-worm spin. When I used to teach (decades ago), I really discouraged people of spinning that way. It is slow and it can never BE fast because of the actions required. I draw against the pull of the wheel…and not against my hands (which saves my hands, too). I used to long draw, but the body parts (as in shoulders) don’t want to do that any longer. Depending on what I am spinning, I spin between 150 and 375 yards an hour, average 250ish. I approached the “production speed” problem by doing what my typing teacher in high school (Yup, my parents made me….that “just in case” stuff.) which was that I spend a few days every other week or so alternating between spinning for accuracy and for speed. So one skein is SUPER FAST, the next one SUPER ACCURATE…and I do that for three or four days. It usually improves BOTH speed and accuracy. If a skein is too much, try an hour (or half an hour or 15 minutes) of spinning as fast as you can while still making a functional yarn. (Use some stash wool you don’t LOVE anyway….and don’t worry about how it turns out. This is about PROCESS, not product!) THEN, do an hour of PERFECT yarn. Then FAST, then PERFECT. Repeat. You will be surprised how quickly both of them improve.